Watching Notre Dame’s skill position talent this spring has been exciting. There’s more speed and playmakers at receiver than they’ve had since the 2015 season. A number of those players are young, which highlights how the future could be just as great as the present. And now the future looks like it can be even more electric with the latest addition to Notre Dame’s 2020 recruiting class. Jordan Johnson‍ is one of the top receivers in this cycle. He’s one of the top of the board prospects for the Irish at any position and he’s the type of the recruit that people would expect to land after going 12-1 in 2018. He’s the first top-50 prospect the Irish have landed for 2020 and I don’t believe he’ll be the last. Johnson is a big play machine DeSmet (St. Louis, MO). He’s a threat to run by a corner on any given play and he does a tremendous job changing speeds to set up explosive plays like this one. More than just a speed guy, he does a great job tracking and adjusting to the ball. He can go up and attack the football above defenders and win in contested situations. More importantly, he’ll fight through contact to gain separation like he does on this touchdown. He shows the potential to be a strong player after the catch and can make the first tackler miss as well displaying the grit to fight for maximum yards. There are very few wide receivers that can be described as having an edge to their game, but Johnson is one of them. He might eventually challenge Chase Claypool for the unofficial record for pancake blocks by a receiver. I love the toughness he plays with, but he’s lean right now. It’s much tougher to fight through contact and defenders grabbing in coverage at his weight. He’ll need to physically mature. He has the traits to develop into a strong route runner, but lacks the precision right now. To be a true number one receiver at the college level, he’ll have to be much more consistent in this area. 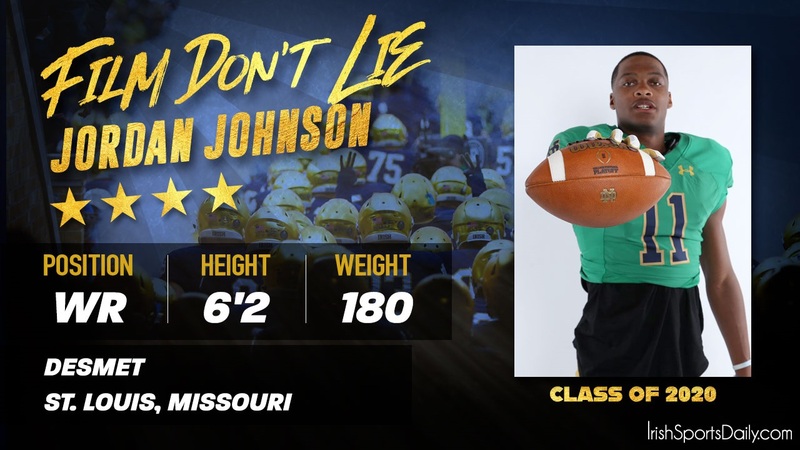 Johnson has legitimate All-American potential if he develops his all-around game because he has the long speed to be a consistent big play producer for the Irish. I wouldn’t quite put him in the Michael Floyd category as a prospect, but he’s not far off and is probably better suited for today’s college football where explosive plays are more valuable than gold. This is a huge pickup for the Irish and someone that I see playing the X (field) receiver position in their offense. If he reaches his potential, then he can be star player at the college level.